This 2018 market outlook is building on recent articles I’ve published as they lay the foundation to the technical discussion I’ll be outlining below. Hence I won’t be repeating them here, but I may make occasional reference to them. If you haven’t read them I highly encourage you to have a read for the additional context & background. Specifically: 2017 Market Lessons, Yearly Charts, The Debt Beneath, and Welcome to Gap Land. In this analysis I’m outlining upside market upside targets I see from a technical perspective as well as select examples of signs I’m watching that would signal a change from the current uninterrupted trend in market prices. Additionally I’ll be looking at some specific price risk zones should the trend change. It is my intent to follow-up on this analysis on a regular basis here in the public section of the site throughout the year. I’m approaching 2018 with eyes wide open in regards to the market conditions we find ourselves in. From my perspective global markets are engaged in the largest asset bubble in our lifetimes (the artificial liquidity bubble) the eventual unwind of which during the next recession will unfortunately hurt a majority of people. Again. 8 years after the financial crisis we remain in an environment that is entirely dependent on artificial liquidity, be it via central bank liquidity driven low rates and/or QE or now US fiscal stimulus in the form of tax cuts. And while a reduction in central bank stimulus is anticipated for 2018 the $1.5 trillion US tax cut is the next active artificial boost to hit markets. You can view it perhaps this way: When the US ended QE3 Europe and Japan took over the stimulus baton, and now that Europe is reducing stimulus the US again is taking the lead, this time with fiscal stimulus. Is the ECB raising rates from record lows? Nope. Has QE ended? Nope. QE continues to run at $30B Euro a month and rates remain in full panic mode. Not what one would’ve expected 8 years ago following a return to full employment. Stimulus programs & interventions used to be methods of crisis management now they have become permanent fixtures in global economies. Why? Because this is what it takes. And they will continue. Japanese Prime Minister Shinzo Abe has just instructed central bank chief Kuroda to keep printing as he decides whether to keep him in his job. Wink wink. Normalizing rates? Reducing balance sheets back to pre-crisis levels? Letting markets run on their own without intervention? Call it the big central banking lie. It will never happen. It can’t. Global debt is now exceeding $233 Trillion. As I outlined in The Debt Beneath the math of higher rates doesn’t work and will eventual break the camel’s back. Low rates are an absolute must requirement to keep the construct afloat. It is no accident that Morgan Stanley wealth management has decided to pull out of junk bonds. They are warning of US tax cuts accelerating market excesses bringing about a coming recession. And make no mistake, a recession will come as we are very late in the cycle. At best US tax cuts may temporarily delay its arrival but ironically deepen the eventual pain as the tax base will have been eroded and more debt and stimulus will invariably be the attempt at a fix. In other words, the usual spiel. If anything, low unemployment rates have historically signaled the end of a cycle nearing not a new one beginning. The sales pitch for tax cuts has been that tax cuts will bring about economic growth. The problem is nobody believes it. Economists don’t, and neither does the Fed. Indeed the Fed appears to be already backing away from their 2018 rate hike schedule knowing full well the risks involved. How confident are they? Oh they know: Loretta Mester: “as interest rates rise, valuations might be expected to fall, which would pose some risks to financial stability”. It’s cute that they are doing this now without even a single down day in US markets and record after record being recorded. It’s no surprise though as we know the Fed’s gaming record on this as well. Stay dovish and at the first sign of trouble back away from any rate hike commitment. After all, just weeks after the 1st rate hike in December 2015 The Fed ran away from its 4 rate hike schedule for 2016. Why? Well, because markets where tanking everywhere. Several assertions of mine: Ever lower rates and more stimulus were required to rescue markets from its bubble bursts over the last 30 years. These efforts have led to repetitive market excesses with ever less organic real GDP growth requiring ever more debt to be sustained and produced. Markets are currently pushed against a 30 year trend line that has not been recaptured since the break in 2008. The 10 year is at risk of breaking above its 35 year downward trend. Markets have no experience of dealing with a break above trend for the 10 year and a break above in 2018 would represent an unknown risk factor. What’s the impact of a breakout on markets that have been dependent on a 30/35 year down trend? The rally since the February 2016 lows were brought about by record volatility compression, a theme I discussed in the 2017 Market Lessons. As you look at both unemployment and volatility you will note that virtually all market history over the past 30 years has either had higher volatility or higher unemployment. The exception being on the unemployment front during the bubble in the late 90’s before that bubble burst. It is no wonder that we see people such as GMO’s Grantham capitulating and calling for a melt-up in stocks. But excuse me, the $NDX is up 10 years in a row, the $DJIA is up 10 quarters in a row and global stocks are up 14 months in a row with RSI readings never seen before. Does that not qualify as a melt-up already having occurred? The premise: An earnings jump induced by tax cuts. And they are correct, earnings will show a comparative improvement as a result of free money which is what tax cuts are. They are not a reflection of organic growth and for this reason this will be a problem for companies in future years. Tax cuts will show a temporary improvement, but future aggregate growth will still have to come from somewhere and it won’t be from renewed tax cuts. My premise is that, all things being equal, a future comparative drag will be built into 2019 and 2020 earnings growth comparisons. Meaning it will be so much harder to show growth justifying forward valuations. This is the valuation context during which we hear talk of melt-up and 3,000 $SPX price targets. Could markets reach the 3,000 area in 2018? Absolutely. In fact I can technically justify it very easily. Take the 2007 highs versus the 2009 lows and you have a 1.618 fib level at 2135 that proved to be resistance in 2015 as price rejected there and then again after the initial foray in 2016. The subsequent dip below during the US election was bought and since then markets have been on an absolute tear. The next major fib level is the 2.618 fib which resides at 3034. There’s your technical justification for $SPX 3,000. So this defines a technical upside risk in context of a market bubble that doesn’t correct and hasn’t produced even a 3% pullback in a record amount of time. Indeed, despite massive overbought readings, record low volatility and historic disconnects on the yearly charts there are virtually no signs that the current trend is stopping. 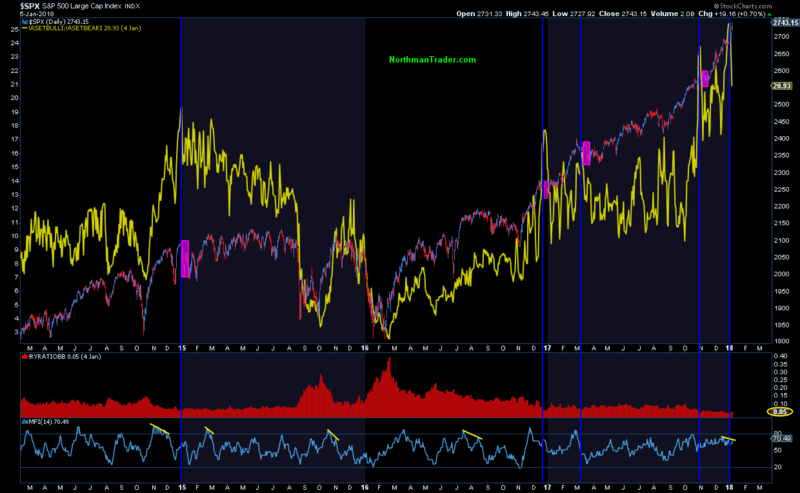 Virtually all major bottoms or tops in the past 20 years have come on the heels of positive or negative RSI divergences. None are evident now. All we have is the most intense weekly overbought reading in recent history. Also major tops have come on the breaking of long standing trends. We are not anywhere near such a break at this moment. Note 2 things have to occur: First we need to see a tag or break below the quarterly 5 EMA. In 1987 it came out of the blue and it came on an extension far above the 5 EMA. So it can happen fast. The most recent tops however showed reconnects first. At this juncture markets haven’t even touched their 5 EMA in 4 quarters. History suggests such a reconnect is coming indeed is far overdue. Currently the 5 EMA is at 2558. Second, we need to see a confirmed break of the supporting trend line. We are not anywhere near it at the moment. It is when these events take place that the current trend can be confirmed to be over. Note that the 2000 top followed a very precise pattern of tagging and then bouncing off of the key fib levels. In 2007/2009 we just retraced the entire rally and then some. A break trend break and repeat of the 2000 pattern could yield an eventual move back to below 2007 highs. Indeed given the size of the current bubble and the unaddressed structural problems the next recession makes a move of such magnitude a distinct possibility. After all what has changed or has been fixed since the financial crisis? According to David Einhorn the answer is: Nothing. And I don’t disagree. All we’ve done is throw free money at the problem, indebted the world more than ever and are hoping for a different result. Best of luck. The fact is most people are not benefitting from this stock market rally, wealth inequality is worse than ever and will amplify even more so while millions of retirees can’t retire as US pension benefits have all but disappeared for millions of people. So the seeds of the next recession are already well planted and we can see it in the data. Still markets have accelerated in price and the volatility compression and price advance program remains fully intact at the time of this writing. Any signs of a change in the current price advance program in the works? Specifically I pointed out the RSI oversold reading marking a bottom these days. Again coming with open gaps and record volatility compression 2018 has begun where 2017 has ended. Except even more overbought and more stretched with even more open gaps. So the current 15 minutes program remains intact and we need to stay alert for a shift in this program. Such is the state of the markets at the very moment. Just ponder that: In a $30 trillion market virtually every single handle down is a buy. Melt-up indeed. I say markets often look their best when they are at their most dangerous. A visit to the upper trend line is again in the markets future. Should a 1993/1994 like corrective move unfold we can expect the open $VIX gap to fill. Such a gap fill could be meaningful from a trend watch perspective as $VIX will have broken outside of its 2 year pattern, especially if the downtrend line then becomes support. We will have to see if price can confirm this move above in the days ahead. For now no corrective action is evident although it is increasingly likely. Should we see $SPX print a weekly close below its weekly 5 EMA in days ahead a 1993/1994 type corrective event toward the lower trend line or weekly 21MA/50MA (2467/2571 currently) represents initial technical corrective risk. From my perch the first larger corrective move in 2018 will likely get bought and we’ll have to assess its relevance at that time based on our technical signals, the price levels it reaches and the context of such a correction. It could well be that such a move could result in new highs and produce a weekly negative divergence. This is entirely speculative at this stage, but given technical upside risk it’s certainly possible. But I also need to caveat this statement by saying that a trigger event could change market dynamics dramatically and quickly. No such a trigger has made itself apparent and often times market commentators will associate a trigger after the fact, but technicals will demand their due and I’ve outlined some of these in Yearly Charts. To summarize: From my perch markets are engaged in a historic blow-off move fueled by artificial liquidity & complimented by a temporary earnings boost. The combined resulting excess in conjunction with no visible improvements to structural problems will worsen the impacts of an eventual recession. As markets are technically vastly extended and uncorrected they remain ripe for an “accident” or steeper correction, however the ongoing effects of central bank and fiscal stimulus continue to dominate price discovery. Bubbles are extremely dangerous to trade as perceptions get warped and prices eventually prove to be illusory. Everybody has to decide for themselves of course what their risk profile and time horizon is when deciding on how/if to participate. From our end the focus will continue to be on identifying and pursuing Technical SetUps across multiple asset classes and act on the signals we view relevant. For the latest public analysis please visit NorthmanTrader. For our market products please visit Services.